Posted in 52 Ancestors Challenge on October 8, 2015 by Amy Johnson Crow. Week 40?! How did that happen?! The optional weekly theme for Week 40 was “October.” Do you have any October birthdays or anniversaries in your family? 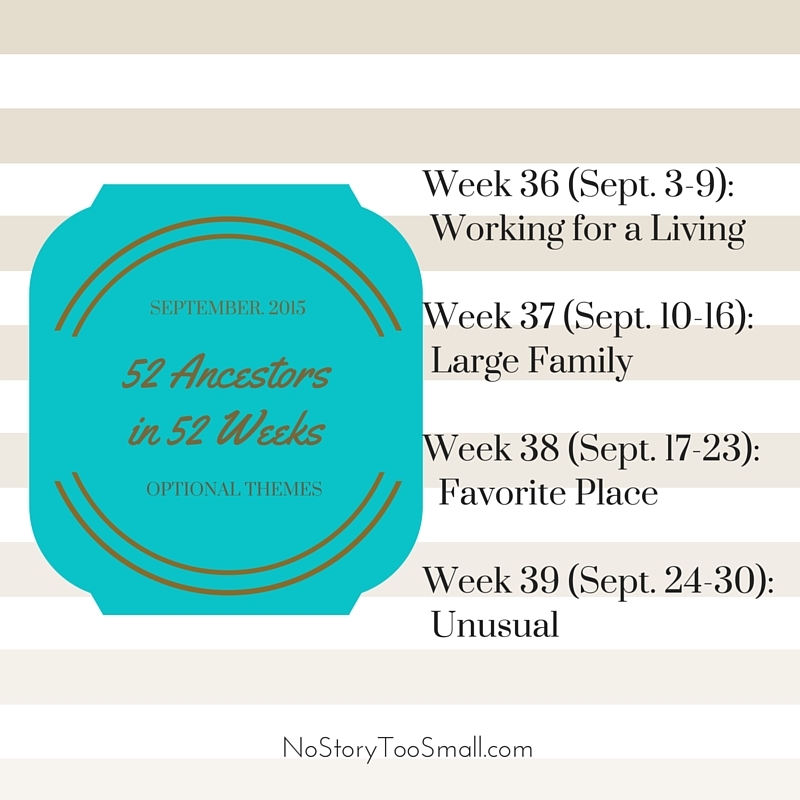 Leave a comment with a link to your 52 Ancestors blog post (whether or not you used the optional theme). And go back to Week 39 for some great reading! Week 41 (October 8-14) – Colorful. Posted in 52 Ancestors Challenge on October 2, 2015 by Amy Johnson Crow. It seems appropriate that the optional theme for Week 39 was “unusual,” considering the unusual weather some parts of the country have had. Did you write about something “unusual” in your family tree this past week? Leave a comment with a link to your post. We’d love to read it! Also, the optional weekly themes for October are here. I think you could have some real fun with the themes. By the way, I recently started a new program “31 Days to Better Genealogy,” a free email series filled with practical tips, tricks, and resources to improve your research. I hope you’ll check it out! Posted in 52 Ancestors Challenge on October 1, 2015 by Amy Johnson Crow. Week 40 (October 1-7) – October: What ancestor has a birthday or anniversary in October? Week 42 (October 15-21) – Proud: Which ancestor did something that made you proud? 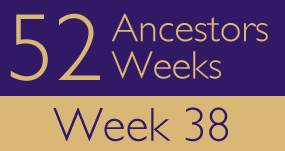 Which ancestor are you proud of finding? Week 44 (October 29 – November 4) – Frightening: Do you have an ancestor who did something frightening or lived through a scary event? Do you have your own ghost story in the family? Now is the perfect time to share! The weekly recaps will be posted each Thursday. Looking forward to seeing your posts! 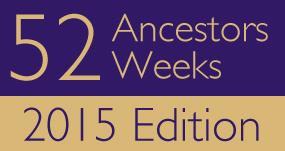 Posted in 52 Ancestors Challenge on September 24, 2015 by Amy Johnson Crow. It’s officially Fall! Believe me, I was more than ready for Summer to be over. Who did you write about this week? Leave a link to your post in the comments below. Also, enjoy the beautiful fall weather by curling up with your laptop and reading the posts from Week 37. October themes are coming – I promise! Posted in 52 Ancestors Challenge on September 17, 2015 by Amy Johnson Crow. Those of us here in the Midwest are currently enjoying some absolutely gorgeous fall weather. Cloudless, deep blue skies. Warm sun in the day and crisp air at night. Leaves that are just beginning to reveal their true colors. It feels like a good time for genealogy. Watch for the October themes early next week! Posted in 52 Ancestors Challenge on September 10, 2015 by Amy Johnson Crow. The optional theme for Week 35 was “School Days.” Week 36 brought us “Working for a Living.” Who did you write about (whether or not you used the themes)? Please leave a comment with a link to your post. Also take a look at the posts from Week 34 (“Non-Population”) — there were some really cool finds in there! Posted in 52 Ancestors Challenge on August 24, 2015 by Amy Johnson Crow. Week 36 (September 3-9) – Working for a Living: September 7 is Labor Day in the United States. Write about an ancestor and his or her occupation. Week 37 (September 10-16) – Large Family. Did you know that all 10 of the most common birthdays are in September? (If you’re a chart geek like me, check out this heat map of birth date frequencies.) So let’s feature an ancestor who had a large family or who was a member of a large family. Week 38 (September 17-23) – Favorite Place: What has been your favorite place to research? Which ancestor came from there? Remember, these themes are optional. They’re meant to spark ideas about who to write about; they aren’t rules you must follow. Posted in 52 Ancestors Challenge on August 21, 2015 by Amy Johnson Crow. The optional theme this week was “defective,” and the posts that I read were anything but defective! On a personal note, as the mother of a Deaf son, I’d like to thank everyone, first, for tackling this subject and, second, for doing so with such compassion. Who did you write about for Week 33 (whether or not you used the optional theme)? Leave a comment with a link below. Take a few moments to look at the posts from Week 32. I continue to be amazed at the writing we see every week. Posted in 52 Ancestors Challenge on August 14, 2015 by Amy Johnson Crow. The days are getting noticeably shorter. Some schools in my area are already back in session. Sweaters are filling department store shelves. And I continue to be amazed — both good and bad — at the speed that it all happens. Several of you had fun with the “32” theme for this week. Cathy Meder-Dempsey at Opening Doors in Brick Walls has probably the most colorful post (literally!) that I’ve seen in awhile. 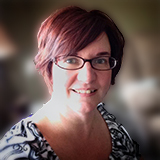 Check out “Johann Gorges and Anna Maria Botz – 2 of 32.” Cheryl Biermann Hartley did a fun twist on the theme with “Anna Odilia Greiner – Thirty-two Things I Know About Her” on her blog My Search for the Past. Who did you write about this week? Was it one of your “32”? Whether you wrote about a 3rd-great-grandparent or someone else, leave a comment with a link to your post and a little bit about them. We’d love to read it! Also be sure to check out the Weeks 30 and 31 recap — it’s double the reading goodness! Look for the September themes early next week!